How time flies, kejap jer dah 11 minggu. So far alhamdulillah, tak der mabuk². Macam 1st pregnancy dulu. Cuma kali ni awal² lagi dah kena heartburn. Masa pregnantkan iman dulu masuk 3rd trimister baru kena. Memang tak bley tido di buatnya, tak selesa...tekak tu rasa mcm panas. Lauk aku cuma ikan goreng & sayur jer, klo cuit sambal sket pon dah terasa heartburn. Tak best betol klo tak dpt makan pedas nih, tapi nak buat mcm mana kan. Your fetus now looks like a baby, with tiny but fully formed fingers and toes. 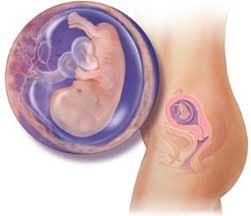 As his body grows and becomes more developed and functional, he'll start twisting and turning like an acrobat, cushioned and protected by your amniotic fluid. You, on the other hand, are probably feeling less like a gymnast every day. Leg cramps, which can sometimes be a sign of calcium deficiency, and heartburn (caused by pregnancy hormones that relax the valve which separates the oesophagus from the stomach) may be annoying you during the day and keeping you up at night. Just remember, all this suffering is temporary — and it's all in a good cause — you're having a baby!